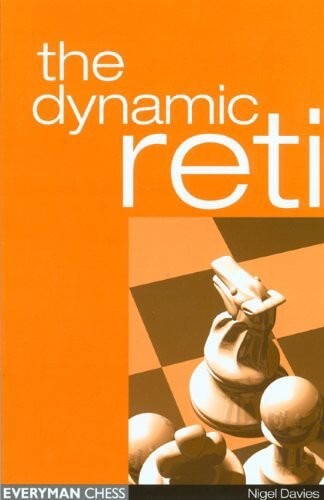 Book DescriptionThe Reti Opening has been a popular choice at all levels of chess for many years and is a favorite among hypermodern players who like to control the center with pieces. Yet there remains a dearth of published material on this subject ... until now. In The Dynamic Reti, Grandmaster Nigel Davies redresses the balance and advocates a repertoire for White based on this refined opening. Davies outlines the typical ideas and tactics for both White and Black, and studies both the fashionable main lines and the tricky sidelines. If you already play the Reti or are looking for a sophisticated new opening weapon, then this is essential reading. NOTE: ALL ELECTRONIC (E) BOOK SALES ARE FINAL. How do I download my new eBook? Once you have completed the purchase, Click here to download your eBooks. They will be available immediately following your purchase. *Please Note: for immediate availability, please create an account beforehand; otherwise we will have to manually email the eBook to you. Once you have downloaded your eBook, when using Fritz, Shredder, or Junior, switch to the Database window, select File menu, select Open, and search for the downloaded file, and click Open. The next time you open the eBook, you will see the name of the book followed by ".cbh" You will no longer use the downloaded file name. With Chessbase Reader, go directly to the File menu and follow the steps above to read your eBook. What format are the eBooks? Chessbase format - They will only run under ChessBase Software, which means that they will NOT run on such e-readers as Kindle, Nook, or iPad. These are not PDFs that you read, but actual, interactive versions of the books. Where can I download a reader if I do not own one? The ChessBase Reader is now available to download for all Training download products. How do I install my eBook? Download the eBook to your hard drive. When using Fritz, Shredder, or Junior, switch to the Database window, select File menu, select Open, and search for the downloaded file, and click Open. The next time you open the eBook, you will see the name of the book followed by ".cbh" You will no longer use the downloaded file name. With Chessbase Reader, go directly to the File menu and follow the steps above to read your eBook. Pentium, Windows 95/98/2000/ME/XP/7/8; 16MB RAM, CD-drive. What happens if I lose my ebook? Your eBook will remain on your USCF Sales Account for at least 30 days. You can download it for free during that time period. We recommend that you save a second copy of your eBook, just in case you misplace the first. Is copying the ebook illegal? Due to the nature of the Electronic Book (eBook) item, eBook purchases are not eligible for return or refund under any circumstances. We're sorry, but all purchases of Download Productsare final and can not be returned or exchanged. There are NO exceptions to this rule as this is the industry standard for downloadable products.